Swissport employees throughout the world enjoy the diversity of working with a range of airlines and the unmatched career opportunities available with a growing, innovative company. We offer industry-leading training and with hard work and a desire to achieve, the career possibilities are endless. At Swissport we never stop looking for better ways to do things and we’re known for our “can-do, will-do” attitude. If this sounds like you, and you’re looking for a rewarding new career, we could be good together! Learn more about what it’s like working with us and see our current vacancies. After ten years working as a concreter, Swissport gave Geoff Kitchen the change he was looking for. And what a change it was! Geoff hit the ground running, was before long promoted to a supervisor position and on his way to a rewarding new career. 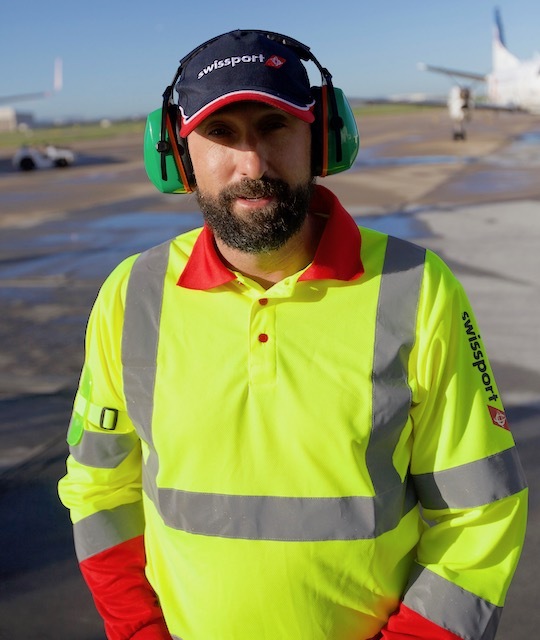 Fast forward three years and now Geoff has a planning-focused supervisory role with Swissport’s QantasLink operation at Brisbane Airport. When asked for his most exciting moment with Swissport, Geoff says that the job itself is pretty exciting. “How many people can say that they go to work and push back an aircraft?”. Geoff’s favourite movie is the Bourne Ultimatum. 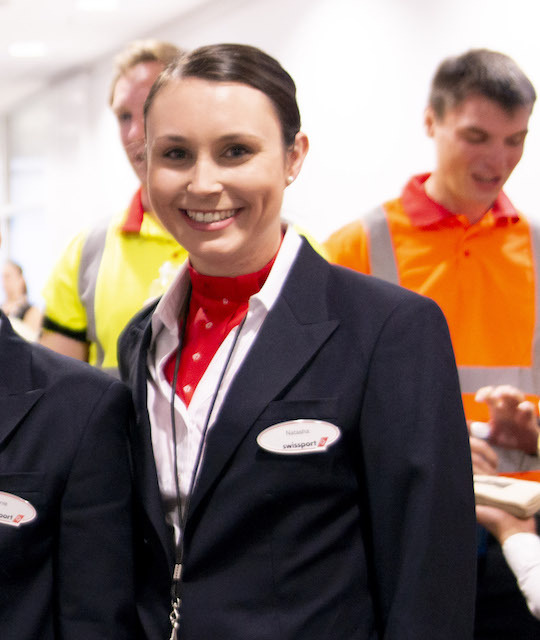 Like many Swissport team members, Kate Langdale applied for a check-in role with her heart set on one day gaining an airline cabin crew position. Again, like so many Swissport team members, Kate found that she enjoyed ground services and has paved a different path gaining skills in check-in, boarding gate, lounge, aircraft movement coordination, recruitment and training. 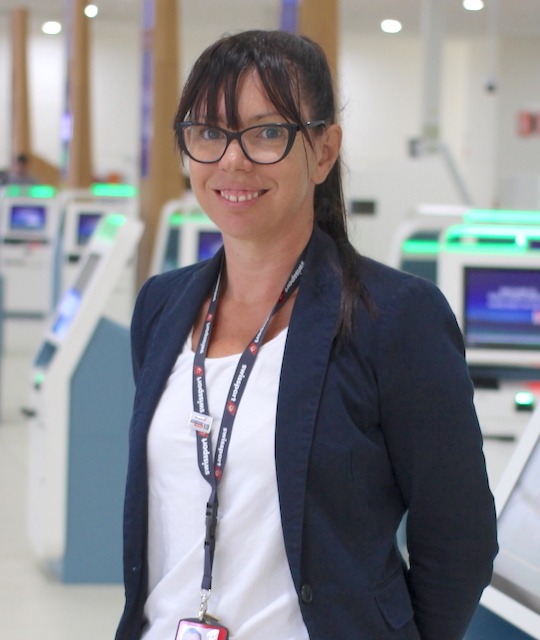 After almost six years, Kate became a Training Coordinator for Swissport’s Perth, Broome and Darwin operations, which was a full-time role focused on supporting trainers and improving training delivery. Swissport has a network of training coordinators through Australia and New Zealand, who speak each week and regularly get together. 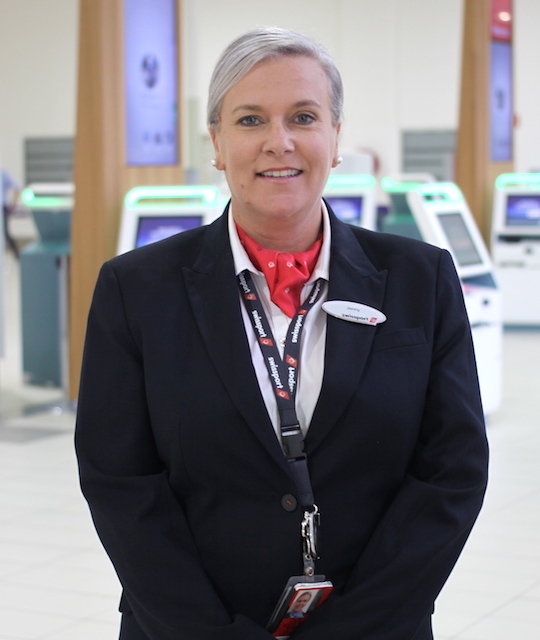 Kate has recently been appointed Customer Service Manager for Virgin Australia in Perth. A career highlight for Kate was securing a place on the 2013 Top 50 Reward Trip skiing in Perisher. “It’s nice to know you’re valued, and I always mention the trip to people when I’m running inductions so they know it’s possible,” she says. 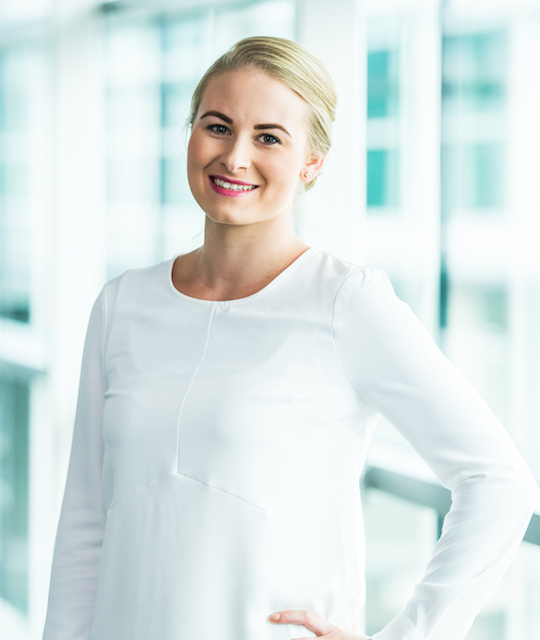 On leaving school Kate tried her hand at university studies and in a real estate agency, before applying to Swissport. She says Swissport is “like a big family” where she has made life-long friends and is constantly learning. Don’t mess with Kate – she loves boxing! 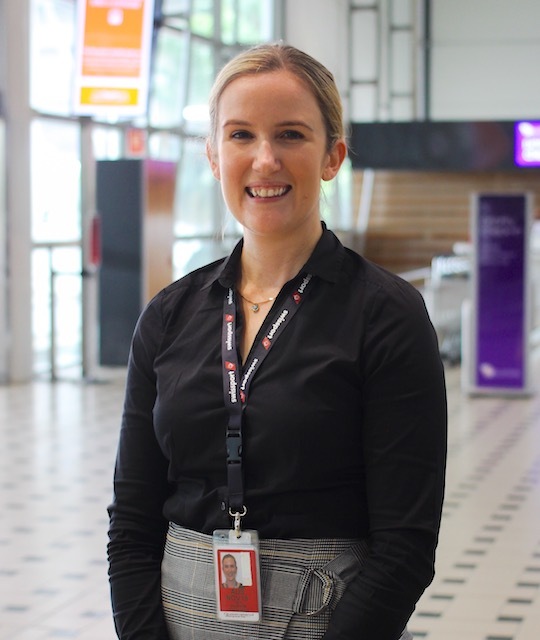 Josie has worked with Swissport for ten busy years, which have seen her working on projects in-house with airline clients, introducing new airlines, overseeing various ports, and going on three reward trips – to Bali, Perisher and Hamilton Island. Josie regularly travels to Indonesia and would one day like to manage operations at a local airport. Steve Hayes joined Swissport in a casual role to supplement his handyman business. 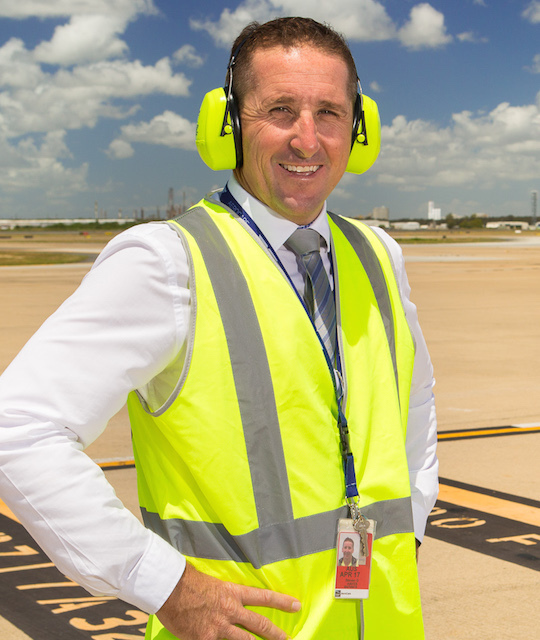 Fast forward eight years and Steve is a Manager Regional Airports overseeing several operations throughout Australia. 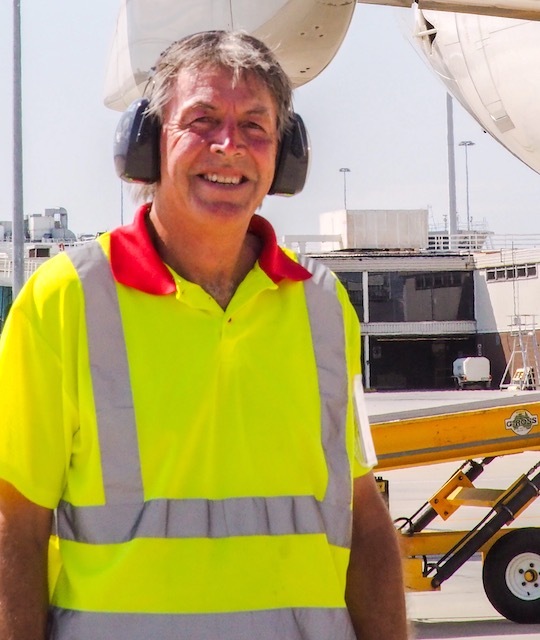 Steve has worked with Swissport at various airports and in a range of different roles, most recently as Manager International Operations at Brisbane Airport. A major career highlight for Steve was winning a place in the Aerocare Top 50 reward trip in 2010, which saw him and a bunch of other high achievers sailing the Whitsundays alongside Swissport CEO – Pacific Glenn Rutherford. 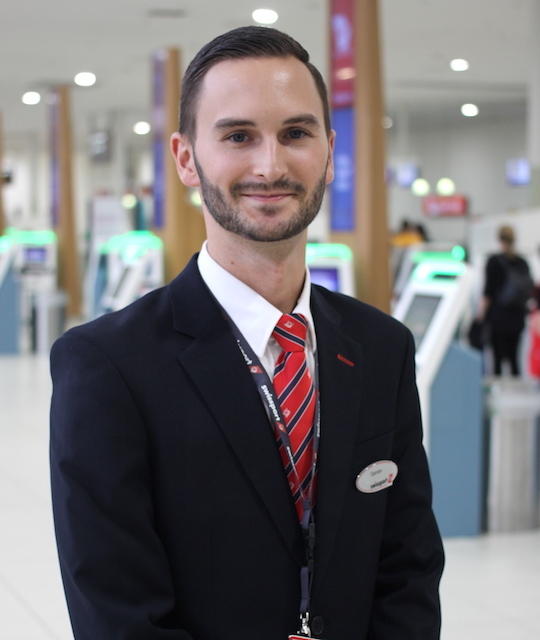 Not long after the trip, Steve was encouraged to take a big step up into the role of manager of Swissport’s Adelaide operations. It was a steep learning curve but luckily Steve says he has never questioned the support he has received from his managers at Swissport. Steve points out that while being a manager is not an easy job, if you can be flexible and go above and beyond, your efforts will be rewarded. Steve believes “sleep is for the weak” and between work and triathlons, there’s never a dull moment! 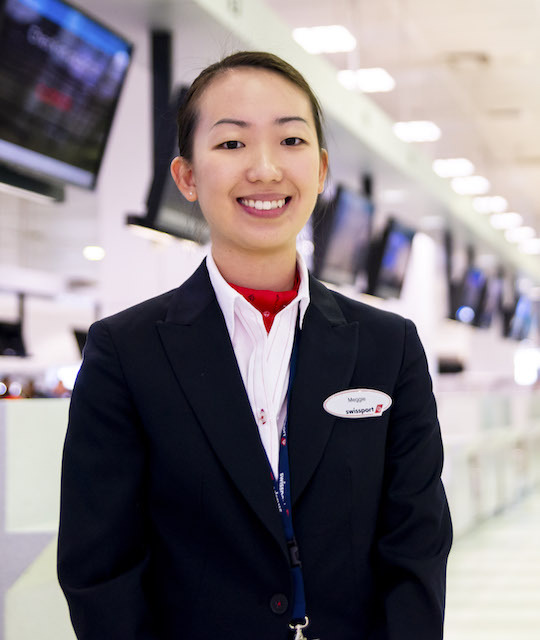 Meggie Pho loves the variety of her role with Swissport and that every day is different. “I’m someone who can’t sit still so the job suits me!” she says. Meggie joined Swissport three years ago after completing a business degree at university and realising an office job wasn’t for her. 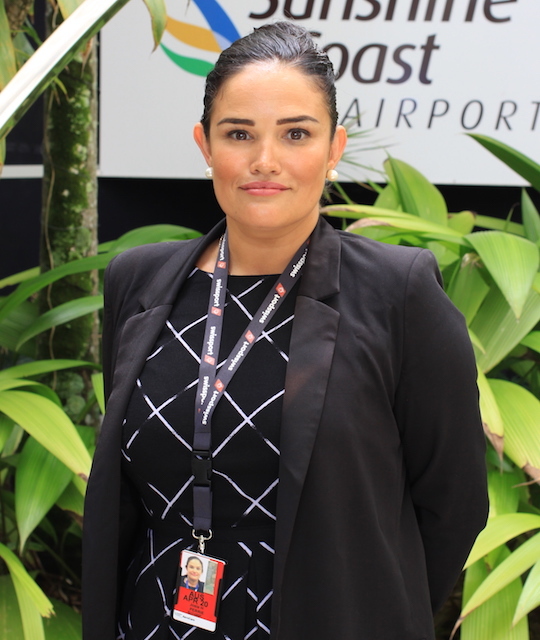 “I do a range of different roles and represent many of our different customers at Sydney International – AirAsia, Cebu, Scoot, Jetstar – which keeps it very interesting,” she says. As well as strong support from supervisors while on shift, Meggie appreciates the one-on-one catch ups that all Swissport team members have each month. “It’s an opportunity to talk about our goals and give feedback, discuss opportunities for new skills and cross training, and generally keep things on track,” she says. Meggie must be a kid at heart – her favourite movie is Ice Age! Greg Spencer’s role with Swissport regularly takes him all over Australia and New Zealand, supporting start-up operations and providing additional skills where they’re needed. 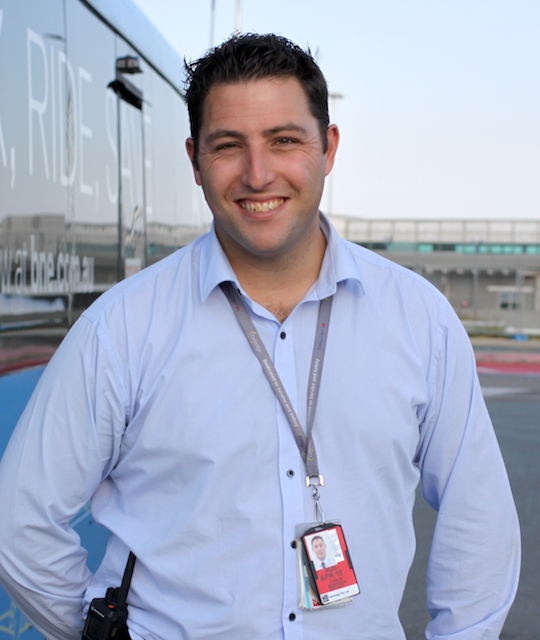 Greg has been based at Perth Airport with Swissport for more than 14 years. He recently took some long service leave to coincide with his volunteering role in ground support at the Australian International Airshow at Avalon Airport. Greg points out that aviation shift work is very different to standard hours, with start times at Perth Airport from 3.45am and finishes as late as 2am. “The work and hours really don’t suit everyone, and if it doesn’t suit you, I think it’s best to move on. In our environment, it’s critical to have a good work ethic and we expect our people to always try their best,” he says. Greg has a pyrotechnics license and flies high-powered model rockets. Jenny Kelley reflects on when she first joined Swissport in Bundaberg in 2014. “For me, as a mum, it was important to get back to work. Swissport has helped give me back ‘me’”! Jenny travelled the world with the Honda F1 racing team! Prior to joining Swissport four years ago, Aristo Gotsis’ aviation experience involved taking holidays and childhood plane spotting! “At first I found it amazing working among the planes and was in awe of it for the first few months,” he says. Aristo owned a chicken shop before joining Swissport! Natasha’s favourite movies are anything starring Channing Tatum! 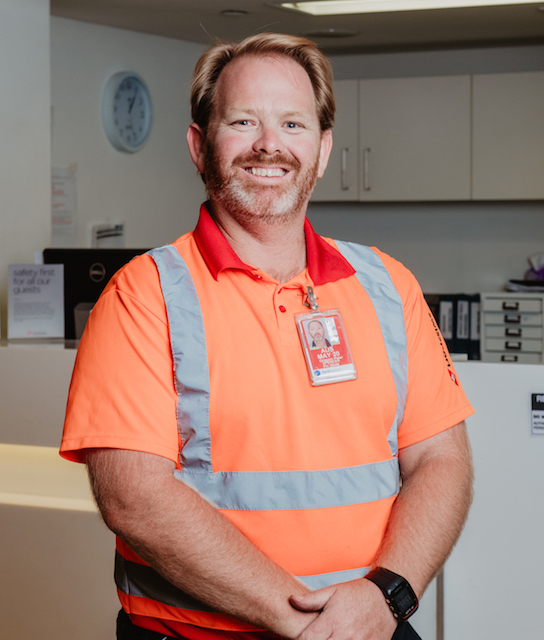 Bussing Operations Manager Luke Morrison loves being a hands-on manager, and it shows – he’s known around Brisbane Airport for always having a smile on his face! Luke’s career has been heavily focused on both airlines and coaches, working in ground operations and cabin crew and management with several airlines and driving for coach companies. He keeps his skills fresh by jumping in the driver’s seat whenever duty calls! Luke once appeared in an English pantomime – as the back end of a cow! Emma feels that her team has real ownership of their operations and full responsibility for how things work. “We have independence, but there is 100% support from head office if we ever need it,” she says. Emma has a gorgeous son named Bronson. Steve Hynes, or “Hynesy” as he’s known, has been part of the Swissport team for a staggering 14 years. He’s seen a lot in that time, but says one of his highlights was helping unload a RAAF-chartered Russian Antonov carrying six 40 foot containers bound for the Woomera Rocket Range. 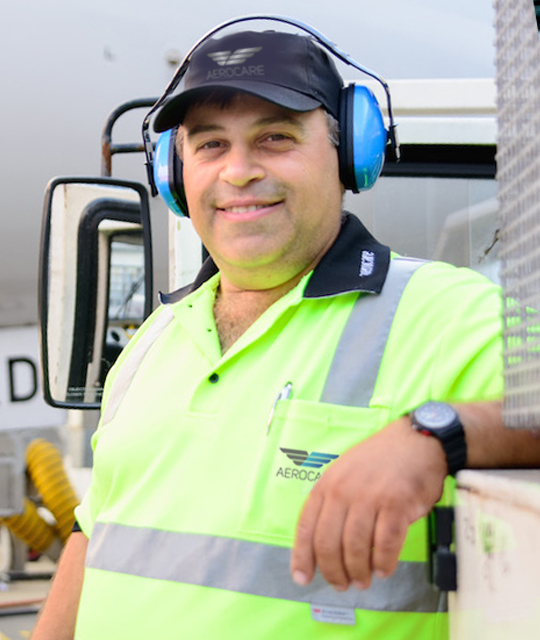 Steve says: “I love the variety of the work we do – the different roles and the different aircraft make it really interesting.” Steve has also enjoyed travelling extensively throughout Australia providing ramp training, and meeting a lot of people along the way. Joining Swissport (Aerocare as it was then) was big change for Steve, as his first aviation role after a long career in the printing industry. He counts among the highlights the friendships he’s made along the way – and not just in Melbourne but throughout the country. Steve is about to notch up his 38th year as a volunteer firefighter and has been awarded Life Membership of the Country Fire Authority! Damien Sutton’s love affair with aviation started long before he joined Swissport (then Aerocare) on the Gold Coast. As a teenager, he took a flying course, held a student pilot licence, did work experience with a ground handler and airline, and studied tourism and travel at college. Damien is very well respected by his teammates, having twice made the company’s Top 50, a peer-voted recognition scheme. He’s been on two reward trips, both P&O cruises, and believes there “is a lot of incentive to do good work”. Damien loves the laid-back Gold Coast lifestyle and tries to spend as much time as possible outdoors. Lara showed great potential from early on as a part-time customer service agent, progressing to a supervisor position, and working as a trainer, which she says ignited a real passion. Lara was promoted to manager of our Townsville operation in mid-2016, around which time the team doubled in size and airline clients through organic growth and acquisition. “It was a big challenge but I felt well equipped and received incredible support from my team and our regional manager,” Lara says. Quickly proving herself as a highly effective team leader, Lara helped drive consistently strong results for the Townsville operation. She mentions company reward trips to Thredbo and Hamilton Island among her career highlights and a start-up operation in Christchurch as her greatest achievement. Lara finally took the plunge in early 2019, formally relocating to Brisbane to lead the launch of services for Air New Zealand. When not cheering on the North Queensland Cowboys, Lara is looking forward to exploring South East Queensland’s beaches and mountains and making the most of Brisbane’s live music scene. Lara was once a competitive figure skater. Sorry, there are no jobs currently available in this field.